. .                                 .  . . ..... Version 1.0 .
enhanced cpu and screen modes. what came before, but not enough of one to take seriously. mountain of commercial games that were written for the STFM. fondly  recall  Aggression's "Brain Damage" demo as the ultimate  STe  demo. dentro, which gave a pretty good taster for what was coming next. are to expect heavy useage of STe hardware! says it is converted on the fly, and the blitter is used to get it onscreen. scrolling and screen splitting features of the STe hardware. by zooming and rotating the texture, but the blitter does all the rest. This  is  one  of the more intricate and "made for TV" parts  of  the  demo. stars. The blitter is implicated here. up and down. It is simply an extension of the screen before. We  come  to the penultimate screen for Pacemaker. 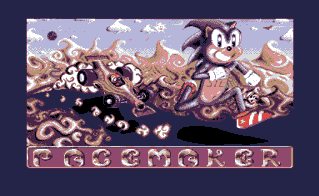 This is the  "Moneyshot"
sprite and sample as supplied by Sonic Team of Sega! 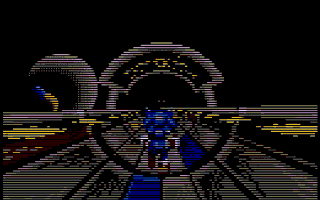 bitplane  logo  in  the  background running  simultaneously to the scroller. soundchip tune we had before. replayed in realtime using a new custom packing technique by RA. Well certainly not brain-numbing, in fact a good effort all round. and will be very hard to beat. The approach of Paradox is a much more careful technical and considered one. for the next one, then we might just have that Brain Damage beater at last! cameo cartoons between the main action. YM melody with Musicmon effects complemented by cool samples at the end. GEE-WHIZ:- 88% - For copious use of STe hardware.